One school of thought is to clear one’s throat and that will tell you where your core is. The only thing I’ve accomplished is a watcher’s helpful “you might want to see a doctor about that cough.” Any feeling of ‘coreness’ goes away as soon as I stop coughing. 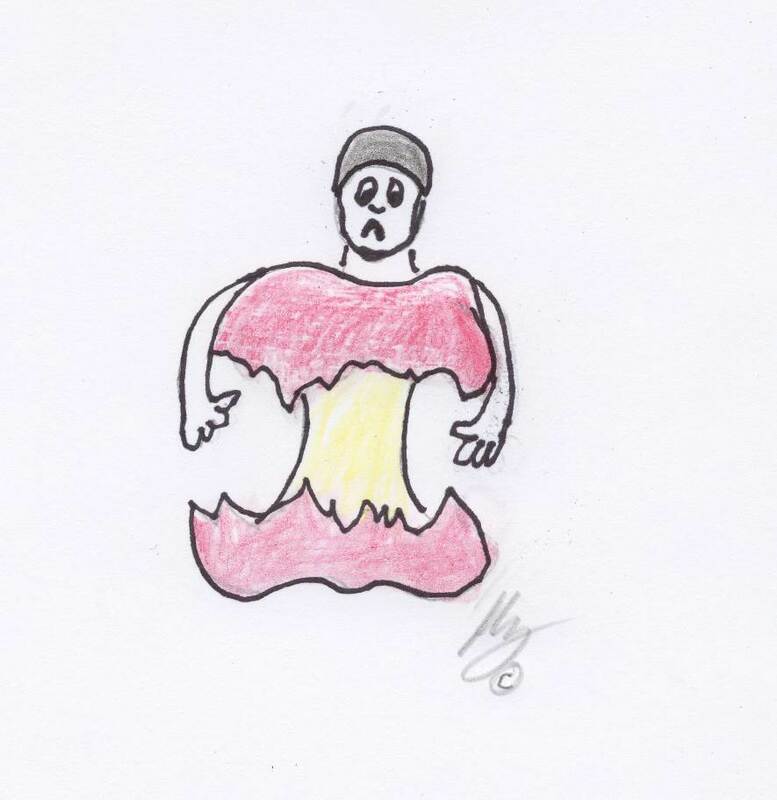 Quite honestly, having a thorough understanding of human anatomy, I know there is no “core”. Muscles? Our anatomy is constantly at odds with our pursuits because we chose to walk about on our hind legs rather than go on the more sensible and stable all fours. I know that everything inside us is literally hung on our spines. Our spine makes up our backside. Where is this core? I’ve not been too worried, though. I’ve come to realize that, whether I have a core or not, everyone rides in her own way, and if one is at harmony with one’s horse, it really makes no difference. But I have seen the light. Actually, I have ‘felt’ the light, having finally discovered that I do, indeed, have a core. I discovered it with an Equi Cube. Before I go any further, let me disclaim: I’m not a salesman. I don’t get a commission for telling you this. It’s not an advertisement, it’s a review of the most effective riding aid I’ve ever used. Let me quote directly from the brochure that accompanied my Equi Cube. “The hardest job you have as a rider is figuring out how to do what your instructor is telling you to do.” AMEN. Sometimes, while in a training session, I think my very competent trainer is speaking Urdu, because I’m not getting it. “The Equicube is uniquely designed in size and shape to assist in core strength and stability while riding.” I am here to tell you , it does. It works. When I received my Equi Cube (I read about it in a local horse magazine), I was surprised by its simplicity-and its heft. The Cube is a square of solid rubber with handles on either side, precisely angled to place your hands (and by extension, your reins) in the correct position. If you are holding it correctly, you can’t NOT hold your hands correctly. Holding it correctly is simple: hold it level. In the picture, the rider is tilting the cube just a little bit. Holding the cube. In this picture, the rider is tilting it up just a bit too much. The Cube weighs a little over 4 pounds, or 2 kilos. One holds it in both hands, with the top of the Cube (its name is on the top, to aid in visually aligning it) straight up. 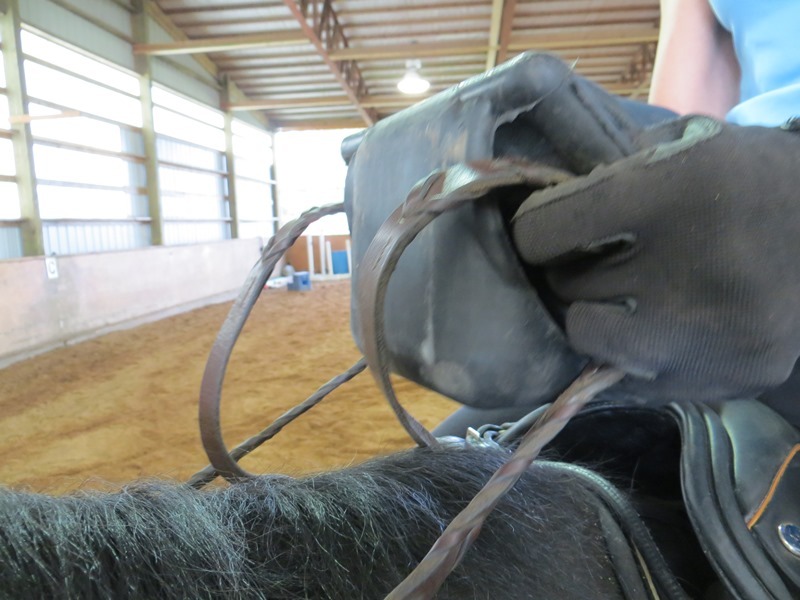 Hold the reins as you normally do, with the top of the rein held up against the bottom side of the handle. Hover it just over the horses withers and voil a’…your core engages. I’m serious. I am absolutely serious. Even sitting in a chair, you can feel your core engage. The first time I rode with it on Raven, I found myself paying more attention to holding the Cube than riding. I was so intent on holding it level that it took a moment for me to feel something inside. Oh my god. That must be my ‘core’!! I DO have one! After a few rounds in the arena, I dropped the Cube (another advantage to its being rubber..no damage) and kept riding. This is where the beauty of it came in: my body remembered how it felt to hold it. My core stayed engaged. My hands stayed in the proper position. Even after dismounting, I could remember how it felt. Of course, the Equi Cube is a ‘lemme see that’ sort of aid. Several other riders in the arena noticed me riding about gazing at a block of rubber and asked questions. I handed it off to one of them. She rode about with it and gave me a quizzical look. She “felt nothing different”. I began to feel stupid, especially when a second rider, probably more talented a rider than the first, asked to try it. She said, “I can see how it might help but it’s not doing anything for me.” But, oh, third time is a charm. The third rider picked it up, with my coaching, and rode away…and a beatific expression blossomed on her face. “Oh my god! I can feel it! Yes, I can feel it, I can feel my core!” She rode and rode and rode. I was afraid I wouldn’t get my Cube back! Today Sue tried it, and she, too, felt a difference. She handed it back to me after several rounds, saying what I’d felt…that after a while, it begins to interfere with one’s concentration on riding. I took it back and began to walk about with it, and then ‘trot’. In all gaits, even on foot, I could feel my core working. I must have looked ridiculous, gallumphing about the arena like a five year old, but, ehhh, folks there have grown used to my nuttiness. (maybe I should have had a stick horse?) Through it all, I could feel my core engaged. My body didn’t take so very long to retain that muscle memory. The Equi Cube was created by a woman I’ll call The Wizard. You have to be one, to be able to create something this simple, this intuitive, and yet this instructive. 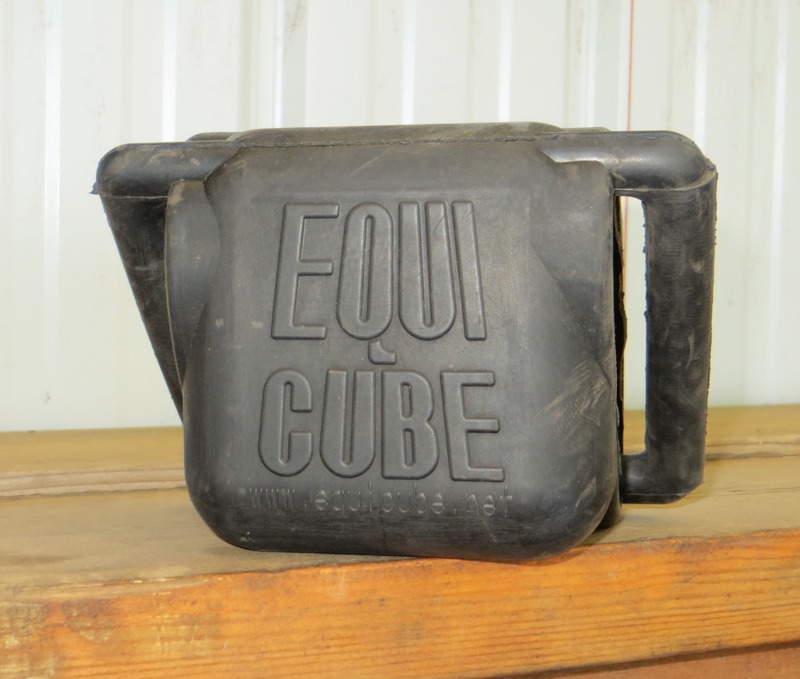 At this time, the Equi Cube is $79.00 US plus shipping and handling. I paid via PayPal. That sped things up, deliverywise. Her website is http://www.equicube.net. The Wizard’s email is Equicube@gmail.com. She’s on Facebook at Equicube LLC. I seldom, if ever, endorse a product or an aid…but I am heartily doing so here. 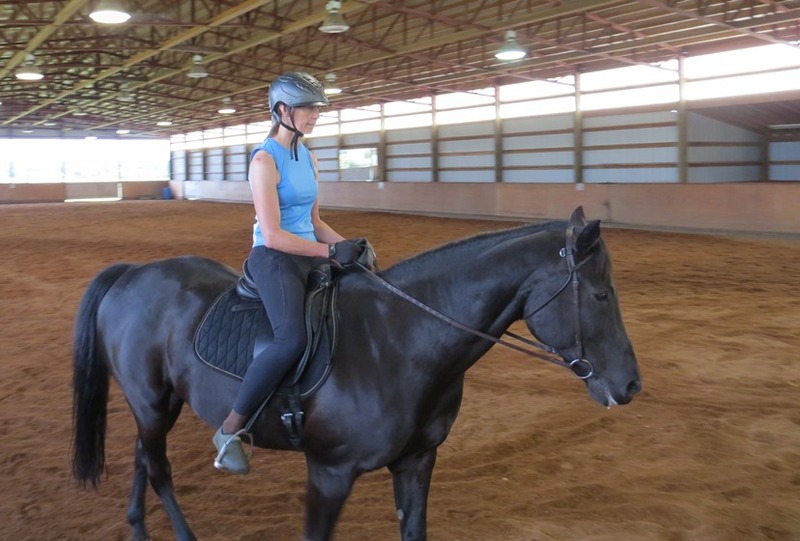 This entry was posted in Uncategorized and tagged horse, horsemanship, riding, riding aids. Bookmark the permalink. I think I’ve learnt to engage my core the slow way (i.e. about a year of wondering what on earth my instructor was on about, although her her wording is “Feel it in your tummy! Use your tummy! Ride with your tummy!” I asked her what I was supposed to be *doing* with my tummy and she couldn’t tell me, but this would have been amazing about then to answer my question!